Preheat oven to 400˚. Scrub potatoes, poke a few holes in each, and bake until tender, 40 to 60 minutes depending on the size of the potatoes. Remove from the oven and set aside. In a food processor, combine chickpeas, cooked brown rice, pecans, pepper, and salt. Pulse a few times until mixture comes together and resembles a coarsely ground meal. Heat a skillet over medium low heat and add mixture to pan (if using a pan that sticks, add a little olive oil). Stirring occasionally, heat mixture until fragrant, 4-6 minutes. Remove from heat and stir in the BBQ, starting with 4 tablespoons and adding more as you like. In a small sauce pan, add shredded cheese and cornstarch. Turn on heat to medium low and heat until cheese starts to melt. Add milk, garlic powder, and salt. Whisk until the cheese is smooth and sauce like. Continue to heat and add milk to reach a cheese dip consistency (cheese shouldn’t congeal together- continue to whisk and if that doesn’t work, add 1 tablespoon of milk at a time). 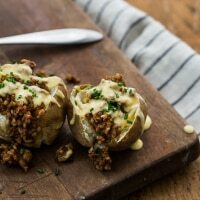 Slice baked potatoes in half, stuff with bbq mixture, and drizzle with cheese sauce. Finish with a sprinkle of fresh chives.